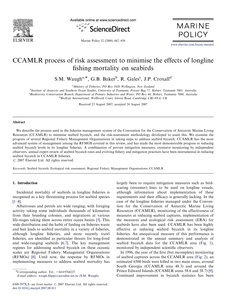 We describe the process used in the fisheries management system of the Convention for the Conservation of Antarctic Marine Living Resources (CCAMLR) to minimise seabird bycatch, and the risk-assessment methodology developed to assist this. We examine the progress of several Regional Fishery Management Organisations in taking steps to address seabird bycatch. CCAMLR has the most advanced system of management among the RFMOS covered in this review, and has made the most demonstrable progress in reducing seabird bycatch levels in its longline fisheries. A combination of proven mitigation measures, extensive monitoring by independent observers, annual expert review of seabird bycatch rates and evolving fishery and mitigation practices have been instrumental in reducing seabird bycatch in CCAMLR fisheries.